Forget-Me-Not is a freeware arcade game reminiscent of classics such as Pac-Man and Centipede, offering simple visuals but extremely addictive gameplay. Forget-Me-Not tries to get some of the old-school magic back, betting on simple but challenging mechanics that keep players invested in the game. 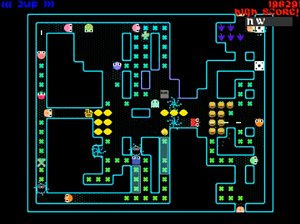 Forget-Me-Not offers randomly generate mazes and tons of levels with increasing difficulty, with the goal being that of eating all the pills in the level so that the level exit may be opened. Some monsters will try to stop us, along with a few surprises.